Academic content and insights into looming update of the Quadrennial Homeland Security Review dominated the 10th Homeland Security and Defense Education Summit March 23-24 in Arlington, Virginia. 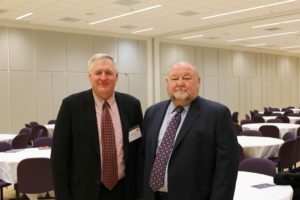 More than 280 participants attended the annual gathering hosted by the Center for Homeland Defense and Security University and Agency Partnership Initiative and, this year, George Washington University in partnership with the Department of Homeland Security and the Federal Emergency Management Agency. UAPI’s mission is to nurture homeland security education across the country by freely sharing curriculum and partnering with universities and agencies, which now number 371. The summit brings together academics and practitioners in the discipline to examine emerging issues and trends. CHDS Director Glen Woodbury catches up with U.S. Coast Guard Admiral (ret.) Thad Allen, who is now Executive Vice President with Booz Allen Hamilton. This year’s theme, “Overcoming Barriers: Looking at the Next 10 Years of Homeland Security Strategies, Plans, Policies and Education,” covered emerging topics and educational methods with a final session on the QHSR. The content was reinforced by well-known keynote speakers such as Admiral (ret.) Thad Allen, former Coast Guard Commandant, along with retired U.S. Army General Keith Alexander and Susan Coller Monarez, DHS Deputy Assistant Secretary for Strategy and Analysis, along with a featured presentation from former Army Undersecretary and Lockheed Martin Corp. CEO Norm Augustine. Presentations and assorted panel discussions ranged from pedagogy to intelligence analysis. Graduates of CHDS educational programs were among those leading presentations. They included Don Zoufal, “Sailing a Sea of Video Surveillance Data: New Approaches to Navigating Policy Development and Analytics;” John Comiskey, “Homeland-Hometown Security: A Coherent National Strategy to Protect Homeland;” Ed Welch, “The Future of Policing in America;” Mike Aspland, “Social Network Analysis, “and Mark Landahl who co-presented a session on small business a vulnerable population. DHS is amid crafting its 2018 review which is expected to be submitted to congress by December 2017. The document serves as a sort of blueprint, offering recommendations on homeland security priorities. The department seeks input from government and non-government during the three-year long review process. Sharing the collective expertise of partners with the review process illustrates the maturity and evolution of UAPI, coming at a time when interest in the discipline in academia continues its growth. Increasingly, business and engineering schools are incorporating homeland security into their curriculum, joining the criminal justice and public policy programs that drove the field in its early years.